The stories of This Side That Side: Restorying Partition spill into the mind like immigrants from across the border – seeking refuge from the oblivion of forgetfulness, bereft yet proud, anxious to be heard, taken seriously, desperately in need of a telling, of finding a home on paper. To read this book is to hear them all simultaneously – the verbose and the reticent – all speaking together, so that they may be registered, and counted as the stories of the world. Some arrive as orphans, others as groups, some as officials accounting for the horrors of the partitions that have divided this sub-continent time and time again. Indeed, in the pages of this anthology of graphic narratives, oral histories, fictions, poems and premonitions jostle for space within the confines of two covers. No less than 40 contributors weave together 28 separate texts, each the result of an unprecedented collaboration between writers, artists and illustrators from India, Pakistan and Bangladesh. That a project of such scope was conceived and executed is a matter of some consternation: how did these stories ever get away from their keepers? For the better part of the 20th century, the two Partitions – of Pakistan from India and of Bangladesh from Pakistan – are events that have lived only in memory. Glossed over in history textbooks, conveniently generalised in public consciousness, they are mere formalities, political necessities that occurred on an impersonal, continental scale. That there were individuals who suffered through them, communities that were torn apart for them, is a concept that we do not learn in India. Partition is an idea that does not affect us, for how could the events of 1947 and 1971 have anything to do with a global superpower in 2014? 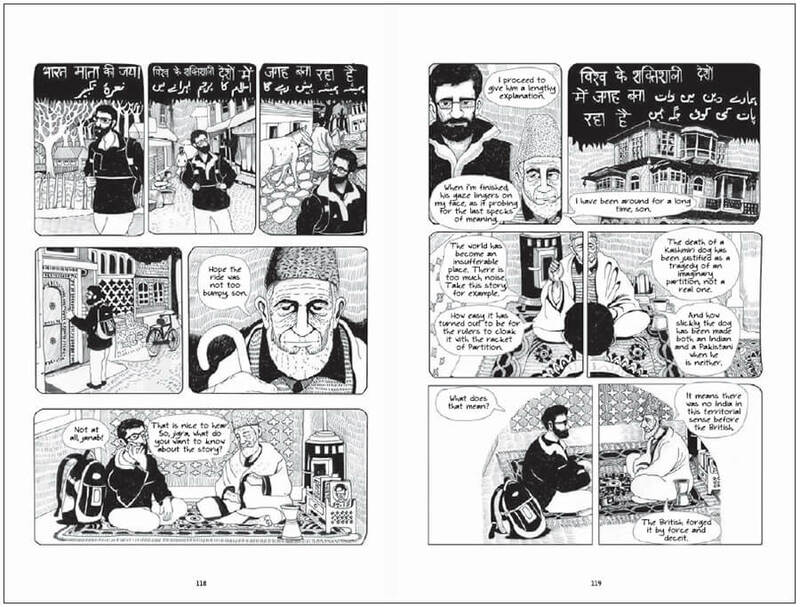 And yet, that is exactly why this anthology is so moving – through words and images, drawings, collages and painting, the makers of these works bring us the stories of their grandparents, the fables of their forefathers and the accounts of things they have seen and done, if only in the received memory of their narrators. The surrogate storytellers of This Side That Side are able to do what few have been able to do before: to treat the subject of Partition with wit and dry humour, to be respectful to their text and still retain the colour of an imaginative rendering. Whether it is Tabish Khair and Priya Kuriyan’s An Old Fable, a delightful Pirandello-esque exposé of the absurdity of dividing a living being, or Arif Parrey and Wasim Helal’s Tamasha-e-Tetwal, a poignant perspective on a day in the Kashmir Valley, it is clear that some of the writer-artist pairings have been fruitful. Arundhati Ghosh and Appupen’s beautifully drawn Water Stories is as haunting as the subject of their narrative, while Cybermohalla Ensemble and Amitabh Kumar’s Make It Your Own forms a delicate juxtaposition of poetry and figments of symbolic objects. 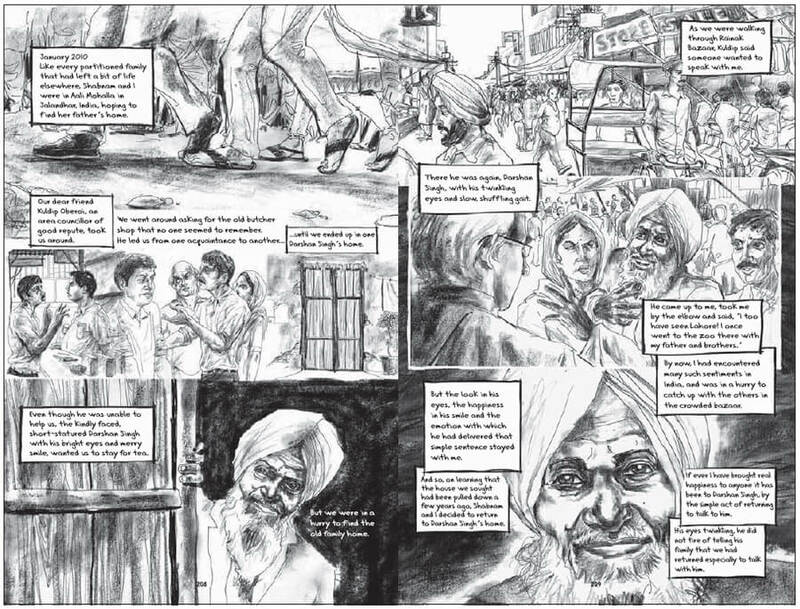 Experienced graphic novelist and “curator” of the book Vishwajyoti Ghosh transcribes his civil servant grandmother’s accounts in A Good Education with the density of illustration and text that one has come to expect from the author of Delhi Calm, a fabled re-telling of the Emergency years in India. What is his pre-disposition towards “re-storying” history, one might ask, but perhaps that is the subject of another essay. By his own admission, the project of assembling these narratives and telling these stories comes from Ghosh’s own wish to write such a book, but didn’t “manage to”. For the promise that it holds and the opportunity that it unfolds, one must then ask why the book itself did not receive as much love and attention as the stories it contains. Clad in a paperback cover, perfect bound to every inch of its 330 pages, a bibliophile would want to know why could this book not have been the object of memory, the artefact it deserves to be? In a handful of years its cover will tatter, its binding come apart and how then will these stories be told when their pages have scattered like the memories they carry? Is this book not a witness to the monumental effort it entails, and if it is, then why does the reader not feel the weight of its significance in the hand? The experience of a physical book is like the experience of a physical building: a journey from light to dark, from mass to void, the right punctuation can sing in harmony or rise in epiphany. Architecture and publication design have much in common, and this anthology could have done better to keep the reading experience in mind: crowded with visuals, over-designed and over-wrought, the individual narratives suffocate next to each other. A blank page or white space between them would have released the reader from the onslaught of imagery, given room for her to navigate, to put down the book and return to it after some time had passed. Indeed, this book would have benefited from some silence. But perhaps the experience was meant to be dense, and this reader was hoping otherwise. In the march of narratives that this collection presents, one is reminded of comic-journalist Joe Sacco’s Palestine, but unlike his interview-format account of the Middle-East, the stories here are personal, sometimes intensely intimate. They are in fact, the progeny of Marjane Satrapi’s Persepolis, or more appropriately, her Chicken with Plums – a telling of her uncle’s last eight days before his passing. 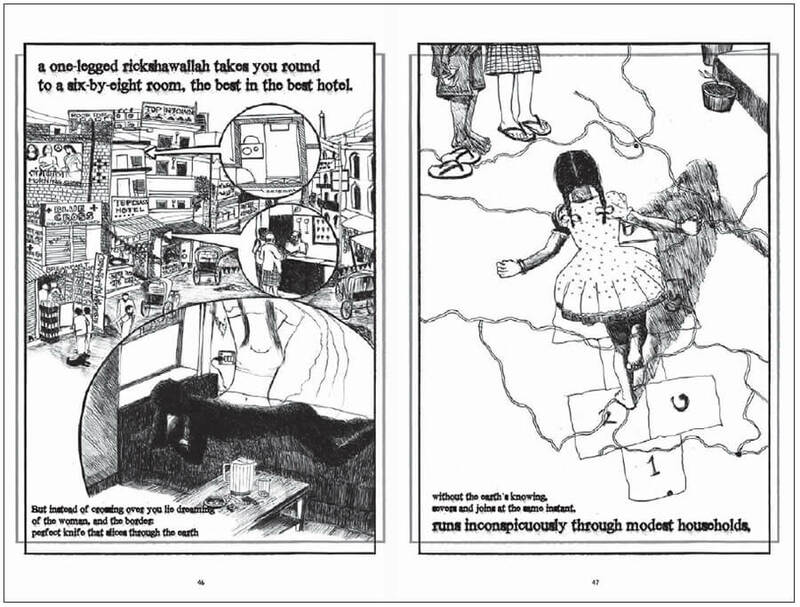 Like the authors lamenting the inevitable outcomes of Partition, in her work Satrapi presents us with vignettes from her uncle’s past and of his children’s futures. She embodies his conflicted sense of identity – as well as the identity of the Iranian people – in his musical lute, which, once broken, cannot be repaired. 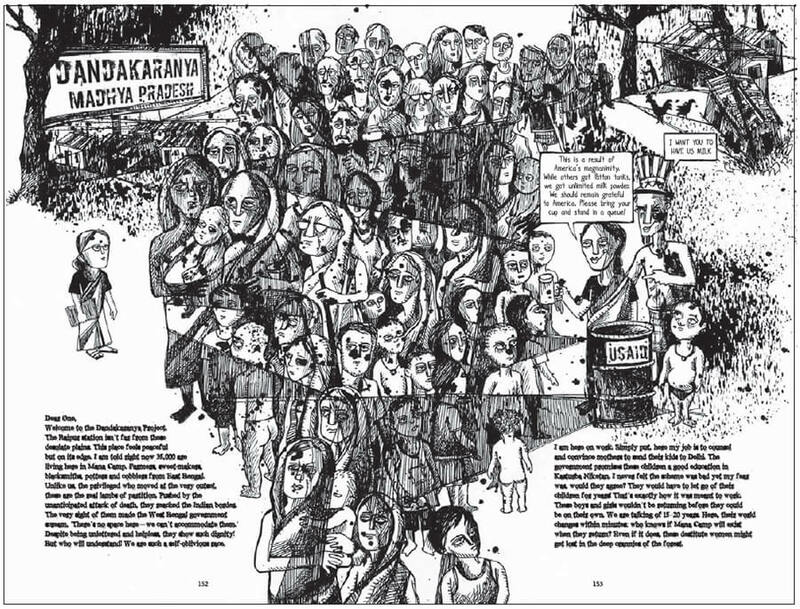 In this respect, the makers of This Side That Side join the ranks of artists and writers who have turned to the medium of graphic storytelling to evoke personal histories. These renderings seek to address the dominant narratives that have been written about major events of the twentieth century, offering a deeper, richer – often alternative – account of war and trauma. Are these the “true” versions of history? Does it matter whether they are “authentic”, that they undermine the official histories we learn in school, and open wounds that have still to heal? Perhaps the graphic medium lends softness to the questions we have yet to resolve as a nation. And perhaps it offers us a gentler path into thorny thickets – a shallower climb to the top of the hill from where we can look back on the journey we have made, together with our neighbours. This Side That Side is but one of the first steps on this journey, and for that alone, it is a brave and valiant effort. May the road be paved with many more such endeavours. This review first appeared in the February 2014 issue of Domus India and has been re-published here with their kind permission. Each image is copyright the respective authors and is used here for the sole purpose of this review. Ruchita, very moved by this review. Now to get the book when I am in India next! Have you heard of Chintan Girish Modi? He has founded an organization called “Friendships Across Borders–Aao Dosti Karein” , a much needed initiative in these fractured times.